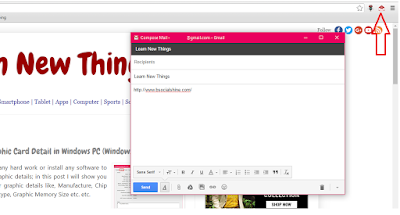 The old fashion of sending link was copy and paste web URL into email compose than send, but here I will show you easy way to send or share any website URL link to any email or gmail. Just follow these easy steps. 2. Open website which you want to send URL link, click on “email icon” right on the top, a URL link and title will automatic add in the compose box, add recipient email and click on “Send” that’s it.